“If you can’t run with the big dogs,” it has been said, “then stay on the porch.” However, in the sport-utility-vehicle world these days, the smaller dogs seem to have the run of the place. What’s a self-respecting big dog to do? The Armada’s Platinum Reserve package nets exclusive 20-inch dark chrome wheels, as well as a dark-chrome finish on the front grille, door handles, and rearview mirrors. That’s the question that confronted Nissan as it pondered the future of its body-on-frame V8 full-size SUV, the Armada. It had been built in the U.S. on the Titan pickup chassis until 2015. Then, with a new-generation Titan coming—and initially only in heavier-duty XD form—Nissan switched direction for the Armada. After skipping the 2016 model year, the big SUV returned in ’17. It was still on a truck chassis, but now the underpinnings came from the Patrol that Nissan makes in Japan and sells in various global markets. Inside, the Platinum Reserve package adds premium interior-trim upgrades, including two-tone leather seats with unique stitching. Having reestablished the Armada, the next task for Nissan is to raise the big SUV’s luxury quotient in 2018. That responsibility falls to the Platinum Reserve. The Reserve is something of an “option model,” created from a $3000 package tacked on to an Armada Platinum. The 20-inch alloy wheels wear a dark-chrome finish that is specific to the Reserve. Exterior bright trim gets a matching look. Inside are premium two-tone leather-appointed seats with contrast stitching and distinct waffle-pattern centers, and open-pore woodtone interior trim on the dash and doors. Finally, there’s Platinum Reserve identification on the interior and exterior of the vehicle. A 4-wheel-drive Platinum Reserve like the one Consumer Guide® tested has a base price of $65,090. As steep as that sounds, it’s still in line with what other non-luxury-brand manufacturers are asking for the plushest variants of their large SUVs. The powerteam is a direct-injection 5.6-liter V8 joined to a 7-speed automatic transmission with adaptive shift control and downshift rev matching. Drive is via an “Intelligent 4X4” system ($2900 more than basic rear-wheel drive), which delivers power to all wheels for starts, shifts to rear drive once the truck is up to speed, then distributes power front to back as necessary in slick conditions or tight corners. Suspension is fully independent with double wishbones at all four corners. Nissan also slaps the “Intelligent” label on the Armada’s surround-view monitor, cruise control, and rearview mirror. The last is a new feature that permits switching from a traditional mirror to an LCD-monitor camera view. Other premium-model standard tech and convenience features include automatic LED headlights, fog lights, sonar front and rear parking assist, keyless entry and starting, remote starting, heated power-folding mirrors, power liftgate, roof rails, power sliding moonroof, and five USB ports. Electronic safety watchdogs consist of lane-departure warning, forward-collision warning, automatic emergency braking, rear cross-traffic alert and intervention, and blind-spot warning and intervention. Passenger room is generous in the first and second rows. The second-row seats fold and flip forward for easier access to the third row. The Armada Platinum comes standard with a Family Entertainment System that includes two WVGA color screens built into the front-seat headrests, two wireless headphones, and one HDMI input jack. Cabin comfort is addressed through full-length exterior running boards, dual-zone automatic climate control, rear air-conditioning controls, a 10-way power driver’s seat with memory, an 8-way power passenger seat, heated and cooled front seats, heated second-row seats, and a heated leather-wrapped steering wheel. Infotainment emanates from a 13-speaker Bose audio system with an 8-inch display screen; HD and satellite radio; NissanConnect with navigation and remote services; and a trizone entertainment system with dual 8-inch monitors, remote-control DVD player, two wireless headphones, and an HDMI input. There is 16.5 cubic feet of cargo space behind the third-row seats, 49.9 cu. ft. with the third row folded, and 95.4 cu. ft. with both the second and third rows folded. The third-row seats are power-folding, but they move pretty slowly. 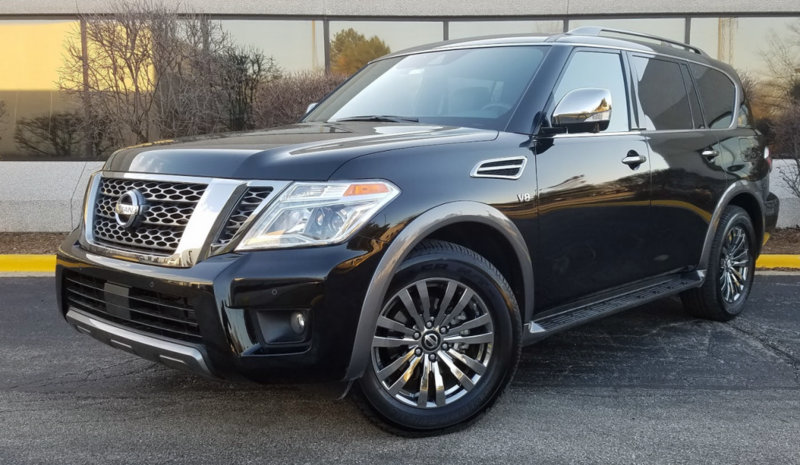 At 390 horsepower and 394 lb-ft of torque, the Armada’s V8 is considerably stronger than it was prior to 2017. Even though it’s propelling more than 5900 pounds in the Platinum Reserve 4X4, acceleration is robust—and not particularly noisy. An Armada can tow up to 8500 pounds when equipped with the optional towing package. With great power comes great responsibility, and Armada owners will be responsible for buying a lot of gas. EPA fuel-economy estimates for the 4WD version are just 13 mpg in the city and 18 mpg on the highway. This reviewer averaged 13.1 mpg after driving the test vehicle for 124 miles, 65 percent of that under city-style conditions. 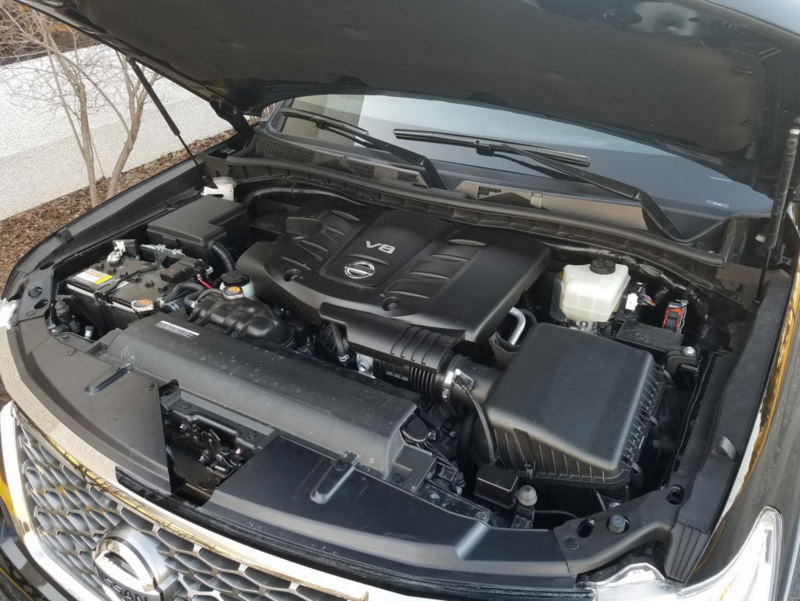 The Armada’s 5.6-liter V8 engine puts out 390 horsepower, which provides strong acceleration despite the hefty curb weight. You’ll pay at the pump, however. Ride is generally comfy with a good degree of bump absorption. 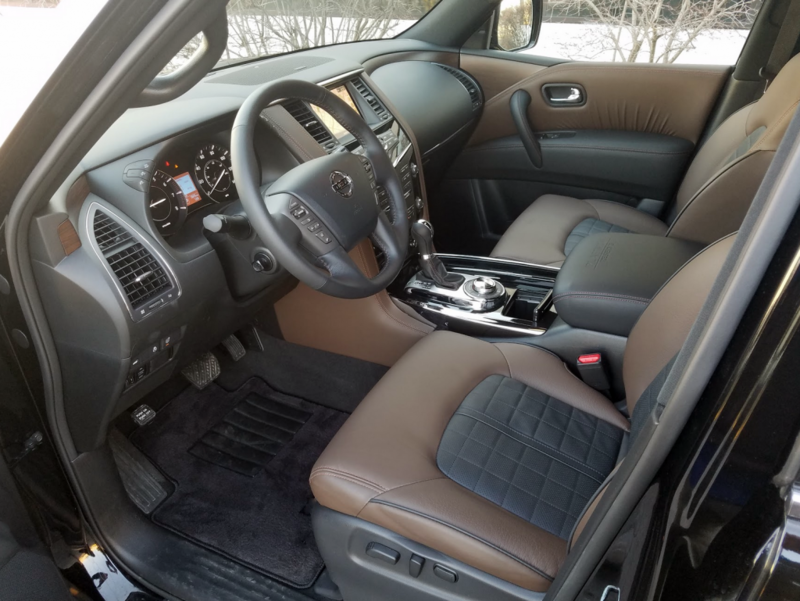 However, with a lofty 75.8-inch total height and 9.2 inches of ground clearance, the Armada pitches somewhat in transitions and over bumps, with a pretty high degree of body lean in corners. It steers fairly easily—the driver won’t sense the vehicle’s bulk—and it stops well. Seats in the first two rows are pretty plush. Third-row seats aren’t as cushy, but their backrests recline with power assist. There is much deeply padded, soft-surface material on the doors. Audio presets are fairly easily input through the screen, but there are lots of control buttons for audio, navigation, climate, etc., on the center stack of the instrument panel. Incidentals storage is handled by a large glove box, wide padded-top console box, and door pockets with bottle holders. There are pouches on the backs of the front seats. Covered cup holders are found in the console, pop-out cup holders spring from the second-row armrest, and exposed cup holders in sidewalls beside third row. Some competitors provide better front legroom, but headroom is fine. There’s good second-row space, and 3-abreast capability thanks to a low driveline hump. (Individual captain’s chairs are an option.) Third-row seats will accommodate a couple of adults if they’re not NBA prospects, but a raised floor makes getting back there a little bit of work, even considering that second-row seats are hinged to pitch forward to clear a path for entry and exit. Speaking of entry and exit, the running boards are a welcome feature given the step-in height. Cargo area behind the third row is very limited—though some small-item space exists under the floor. The rear 60/40 seats power down—slowly—for better load capacity. The middle row also folds in a 60/40 split. With all of these seats down, the load floor isn’t exactly flat, rising gradually with a minor gap where middle and rear seats meet. The market for large SUVs isn’t what it once was, but some buyers still need (or want) vehicles like the Nissan Armada. Every dog has its day. 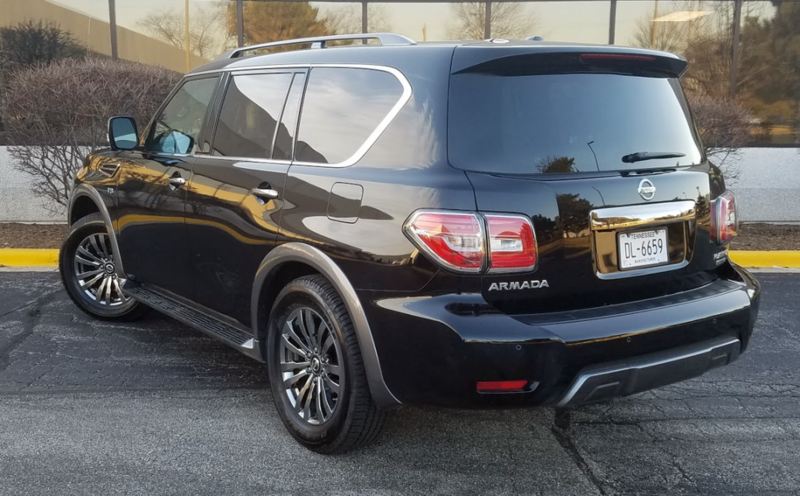 After its redesign last year on the platform of the Patrol SUV that Nissan sells globally, the Armada is mostly unchanged for 2018. It competes primarily against the Chevrolet Tahoe, Ford Expedition, and Toyota Sequoia. Written by: The Daily Drive staff on April 22, 2018.on March 22, 2019.